Wouldn’t you love to lounge around in a hammock while someone else does the grocery shopping? Thanks to Binxy Baby, your baby is about to live the dream. This clever contraption is a cart hammock that clips onto most shopping carts and hangs above your groceries. That means no more massive seat attachments or having to use one of those Buick-sized carts for kids. 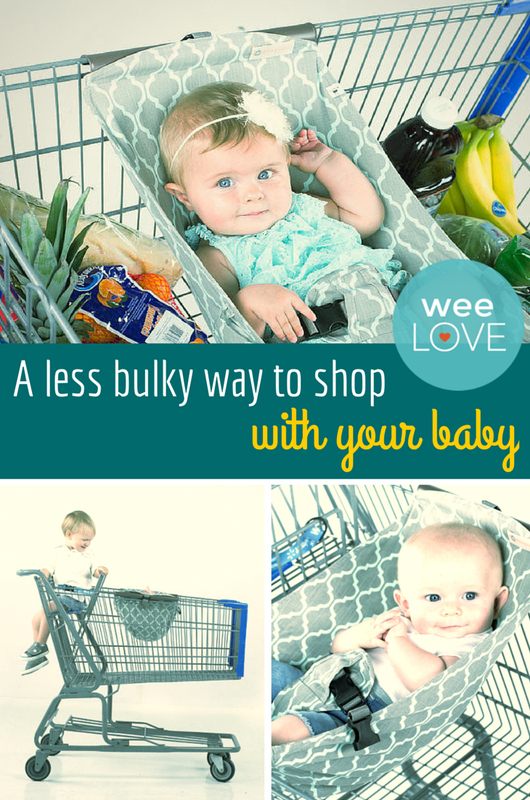 Once attached, there’s plenty of room for baby and all the items on your shopping list. You can even use two in one cart for multiples. Better yet, it’s machine washable and small enough to keep in your diaper bag. 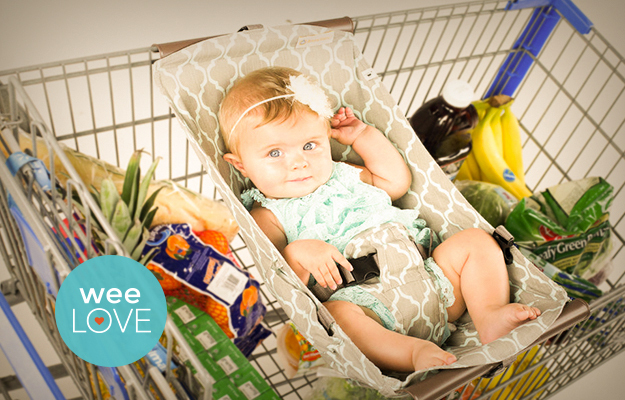 Designed by a mom who had enough of stressful food shopping experiences, Binxy Baby is safe, convenient and fun to use. It holds up to 50 pounds (so, don’t get any ideas mom or dad…). Where can I buy one of these!? I can’t believe I never found these for my first 2 children! Follow the Binxy Baby link in the blog. However,looks like theyare sold out. Normally priced at 39.95. Think I’ll attempt to make my own. Do you sell these in New Zealand? Would like to buy one for my newborn! Please tell me how! Want now now now!!! Just click on the “Binxy Baby” link in the above post–it will take you to the product’s page on weeSpring which has a “buy” button. Enjoy! cute idea! I find it just as easy to carry my baby in my Ergo carrier or Moby wrap, though, and that also keeps her cute hands from touching any germy surface or being touched by overly friendly strangers. How would I find out which buggies these fit on? Just the standard one or would they fit in the double buggies and Sam’s Club? There should be info about what size cars they fit on their website. If you click on the “Binxy Baby” link it should direct you there. They are pretty awesome! I would check with Binxy Baby themselves (they’re linked in the above post) and they should be able to answer your question about colors and prints.